BRYAN EATON/Staff photo. 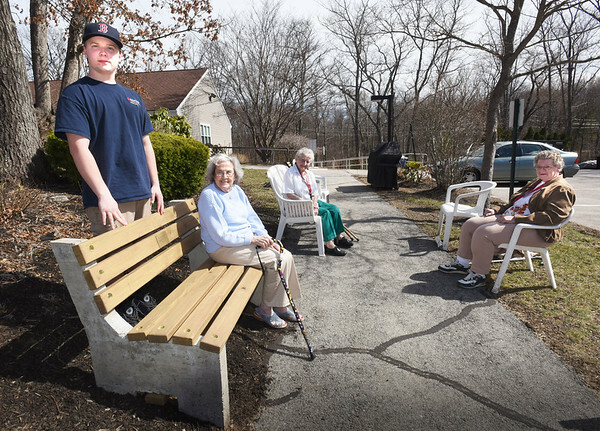 Boy Scout Zachary Wendt with, from left, Rita Connelly, Mary Jane Dushene and Dianne Finnegan, stands next to one of five benches he build at Byfield Eldery Housing for his Eagle Scout project. The benches were dedicated to deceased Byfielders Stephen Cunningham; Worthen "Brownie" Taylor; John Short and Robert "Tubby" Rogers.